The theater is about 80 m wide and could hold some 9500 people. The stage building was destroyed by lightning at the beginning of the 20th century. Although dating from the 2nd century AD and restored a century later (Roman era), it has an ‘auditorium/cavea’ (seating section) in Greek-hellenistic style, that exceeds the semicircular form which was the usual Roman lay-out. 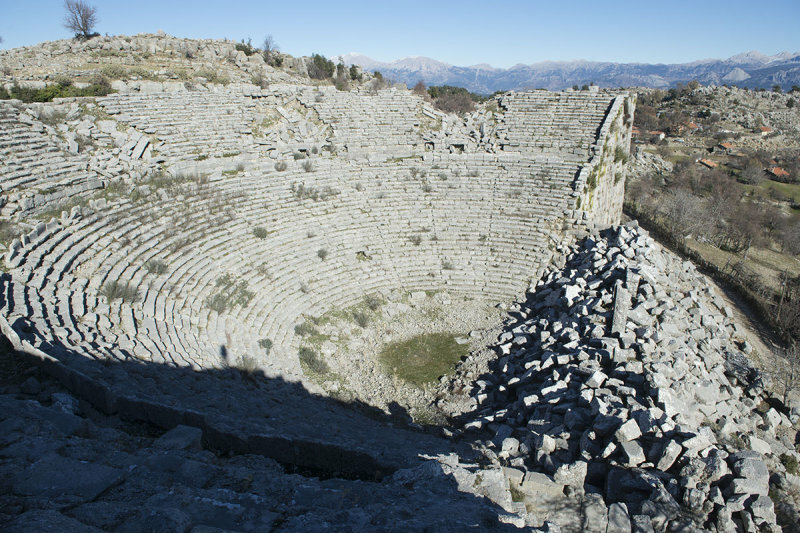 Most of the cavea was cut out in the mountain slope (another feature of Greek theaters); only the retaining walls of its west and east ends were constructed upon their own foundations (in the Roman way). ‘Antik Stadyumlar’ – Secda Saltuk (Istanbul 1995) & Personal visits to Selge/Altınkaya (1992 – 2004) .